I couldn't send Pop off to work on Wednesday without leaving him with a souvenir so I gave him one during dinner Saturday night. His arm was just too inviting on the chair as he steadied himself to get up. They weren't having anything The Cat was innerested in, so I was hungry and bored—a deadly combination. Pop's wrist was the best thing on the menu so I ordered it and put the bitey on him. The result speaks for itself. Do I do good work or what? Nothing says "I love you Pop" like a good "love" bite. Pop's as furry as a kitteh! This was taken fresh on Saturday. Pop's wrist healing on Sunday. You can't see the 2nd scratch. Other than that, I had an EZ Sunday. I hope you did too! Wow, CK, you don't mess around! Maybe next time they'll cook you some fish or something you like! I know how it is, CK. Sometimes I just get in a MOOD too. But I target MOM for my biting, I don't think I have ever bitten Dad. I stay away from hi unless he is brushing me. I am even leery of him when he fixes my food. I prefer Mom to present it. My dear, with that angel face I bet you get away with it. You would here! 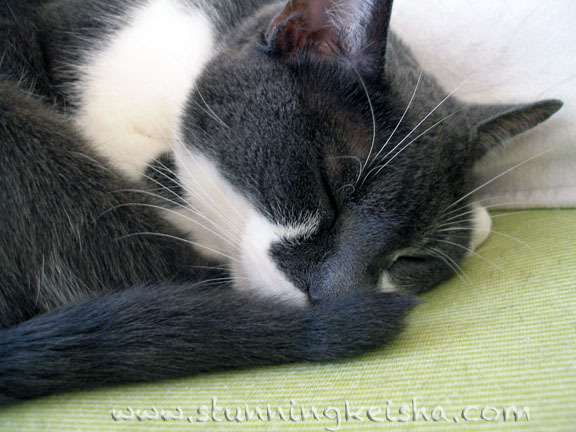 Have a marvellous Monday and a great Labour Day Keisha and give those claws are rest. CK I´m sure I don´t wan´t to meet you when you are in THAT mood !! Your Pop sure will be thinking about you when he's at his new job looking at his arm. Good work. It's best to stay on CK's good side. I'd hate to see the carnage if you didn't love Pop so much! Yikes CK! Pop can get another part time job as a scratching post! HAH! And that's what you do to the one you love most. Poor TW. Ck you rock and when you meow they'd better listen! You are one stunning kitty! No one could possibly yell at you for love bites when you look like that! Sometimes nothing but human bluds will do. Oh CK - we feel sorry for POP because he is so good to you. (Well, TW is also), so it hurts us when you hurt one of them. No, you don't fool around do you. Pretty graphic, indeed :-) But we are kind of used to seeing scratches on live, too! Pop appreciates to have lovely souvenir to bring to work! A kitty has to keep their claws purrfectly honed. What better than a bit of human flesh!!! Wow -- you're so mean!! Good thing you are also adorable, MOL. That was the Labor of Love for Labor Day! Hi darling! Hope Pop survived his first day at the New Day Hunting place--especially considering he had to compensate for that badly wounded arm. The Human wants me to make sure you know it is not her BIRFDAY! She *will* be 64 this year....but not yet!!! CK, you do look like an Angel in that last pic...are you sure the Gutt didn't do it? Maybe he hypnotized you to take the blame? We hope Pop's first day at work went great!